I have yet to see a bad screening in 2016 (granted it's January 15th today, and the only one I saw before this film was The Revenant) and after seeing 13 Hours, I have high hopes for the movies coming out this year. The movie is based on the real events of the embassy attacks in Benghazi, and it's an action-packed film that will keep you on the edge of your seat. 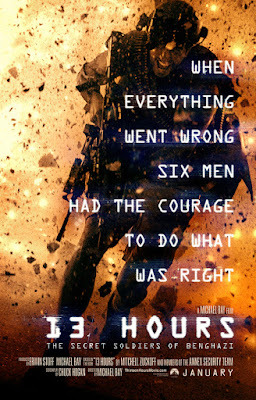 Jack Silva (John Krasinski) goes to Benghazi, Libya, as part of a secret team - G.R.S. - that helps protect the covert CIA compound there. A U.S. ambassador (Matt Letscher) is coming to Benghazi for the week, and he and the team must also lend a hand to the ambassador's compound to provide security. The person in charge of the CIA compound, Bob (David Costabile), likes to do everything by the book, but when things get out of hand at the ambassador's compound, Jack and the G.R.S. team must override him in order to keep people safe. This film was nonstop action and was also a lot gorier than I had expected it to be. The movie has a lot of actors you will recognize, like Krasinski (The Office), Costabile (Breaking Bad), Pablo Schrieber (Orange is the New Black), and James Badge Dale (World War Z). Krasinski definitely steals the show, though, as a father of two kids who always want to know when he will be returning home, as this is his 12th tour of duty overseas; in one scene, we see him talking to them via video chat on a tablet, while they're in the drive-through line for McDonalds, which was an interesting juxtaposition of our everyday world with the wild Libyan world Krasinski's character was currently inhabiting. Yes, see this movie. It's definitely not for the faint of heart, as it's very violent and has a lot of blood and gore throughout, but the story was very interesting, especially to me, since I didn't know much about it previously. The reason the title is "The Secret Soldiers of Benghazi" is that the G.R.S. (Global Response Staff) team basically went unrecognized for their service in Benghazi; the person in charge of the CIA compound got many medals, when in fact he didn't do much (at least according to the movie), and the G.R.S. team was recognized in a private contractors ceremony, but that was it. This film is also based upon a book (13 Hours: The Inside Account of What Really Happened in Benghazi), which I now want to read. I'd recommend this movie for anyone who enjoys war movies or true stories, and I hope it does well at the box office; I debated giving it 4.5/5 stars, but some of the (non-action) scenes were a little over-the-top for me. 13 Hours is in theaters today, January 15th, and is rated R with a runtime of 144 minutes. 4 stars out of 5.